We are used to cards that fold in half, but the Victorians began the fashion with cards intended to be propped up on the mantlepiece or placed tastefully on display among the ornaments in a Victorian home. These first cards were more like postcards - but they became increasingly elaborate and Meg has reflected that high Victorian feel with this gorgeous green-and-gold themed card in the form of a fan. Christmas cards were first sent and received during the Victorian era and this card is based on a design from that time. It stands 15cms high and is finished with ribbon and a small metal flower. 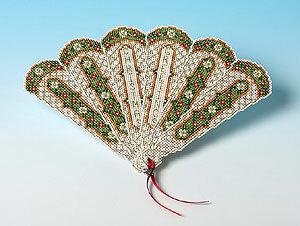 It makes an unusual and special Christmas card but cannot be used as a real fan. Kit contains stitching paper, backing card, stranded thread, ribbon, metal embellishment, envelope, needle, chart and full instructions.